Locating a fabric store that can help you decorate your entire home with luxurious and coordinating fabrics can be time-consuming. 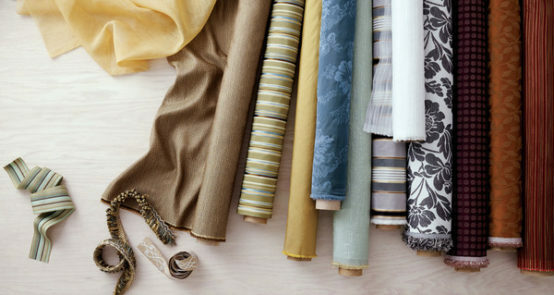 United Decorators in Brooklyn, New York sells exquisite indoor and outdoor fabrics by the yard. Since 1973, United Decorators has been providing exceptional Hunter Douglas window treatment, custom drapery, slipcover, and fabric upholstery services to decorate your home from top to bottom. United Decorates recently renovated its’ fabric store, and Hunter Douglas blinds, custom shades and shutter department. Now featuring hundreds of designer fabrics with various textures and colors. You can peruse the fabric and Hunter Douglas window treatment showroom to select the ideal fabric and window shades for your home or office. The United Decorators fabric store and Hunter Douglas Gallery dealer allows you to choose fabrics that contrast, complement and match each other so that you can create a stunning environment. The goal is to create a sanctuary space you will love and look forward to relaxing in after a long day. Imagine your master bedroom with a beautiful upholstered headboard that stands as the focal point to the room. The drapes, with a room darkening liner so you can sleep in late. A fabric covered headboard adds beauty and warmth in any bedroom. Match the roman shade light-filtering fabric with decorative throw pillows on your bed and accent chairs. The fabric covering the accent chair ties it all together and highlights the custom-made bedspread. It’s not just about your bedroom, every room in your home can benefit from new and exciting designer indoor fabrics. Fabric is usually the first thing people notice about your furniture, so it’s essential to select the right one. Fabric should be durable and cleanable as well as soft on the skin. Hanging fabrics such as curtains and window shades are not just about aesthetic beauty. You’ll want low maintenance window shades and drapery. Window treatments that you can lightly dust are best. Fabrics are available in a range of prices, with selections that include traditional, contemporary, children’s fabrics and more. The brilliant collection of textiles will help you realize your vision for a beautiful home or reupholstered furniture, such as a chair or sofa. 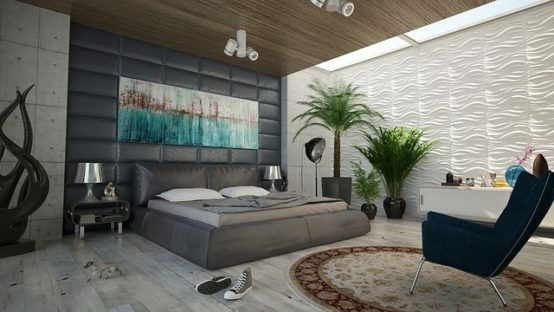 Create a relaxing bedroom environment at United Decorators. 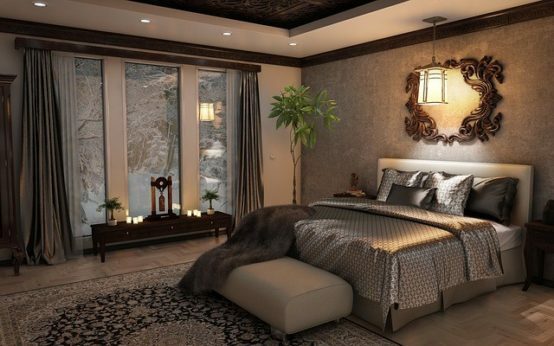 Unwind after a long day and get a great night’s sleep with a new bedroom design. United Decorators offers a variety of custom headboard shapes with high-end fabrics to complement your bedroom decor. The bed is the central element of a bedroom so it should stand out for all the right reasons. Choosing a plush velvet fabric to cover the headboard and beautiful matching decorative throw pillows will make an impressive design feature. You can also change your bedding seasonally. In winter you will want a heavier bedspread and a lighter one during the summer months. Consider what fabrics will feel and look the nicest during seasonal changes. Consider rich autumnal colors for fall and winter to help make you feel warm when you are snuggled up in bed. While in summer choose a lighter fabric in a summery shade of ocean blue. You can choose to have a flat front or have folds. Then select from various sizes, colors, and patterns. Elegant folds and traditional styling make fabric roman shades versatile and durable to stand the test of time. 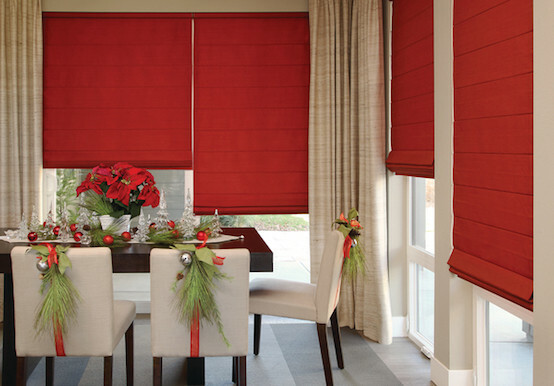 Hunter Douglas Vignette® Modern Roman Shades are available cordless or motorized for pet and child safety. 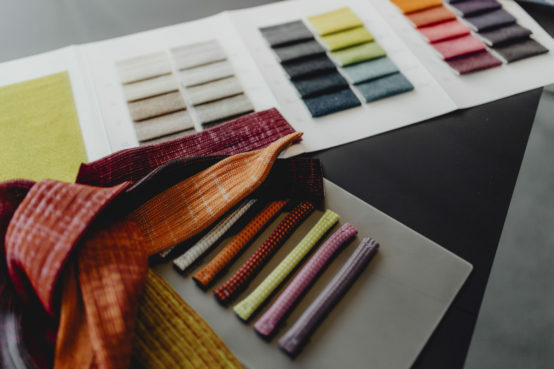 Learn more about this year’s fabric trends by Hunter Douglas. Pair your custom fabric roman shades with beautiful drapery, curtains, valances, cornices, and side panels. Add a drapery style to put the finishing touch on your overall window appearance. When searching for fabrics for your window draperies, consider the trims, tie backs and hardware. Every little element adds a little something extra to the end result. Remember, the attention is in the detail. Whether it’s your dining room chairs, your living room sofa, your kitchen window seat or the armchair that sits in your office, United Decorators breathes new life into old and treasured furniture. When children are grown and start to fly the nest, it may be time to access worn furniture or outdated room decor. Maybe your dog or cats use your chairs or your sofa as their personal beds. Slipcovers are easy to remove and put in the wash to remove animal hairs and dust. The upholstery is an essential part of many pieces of furniture. 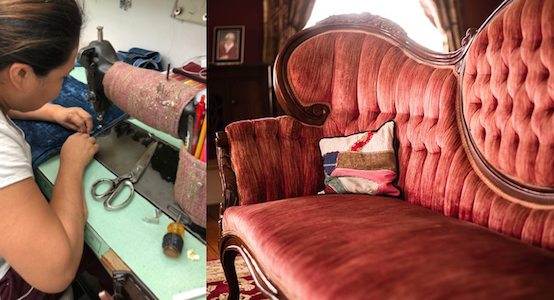 Have you inherited a sentimental piece of furniture you wish to restore to its former glory? The fabrics on your furniture may need repairing or perhaps new upholstery altogether. Reupholstering your furnishings can be as simple as replacing worn out material with new fabric in a similar color and style. It can also mean reviving the cushions and structural padding, however United Decorators can strip your furniture down to the springs and rebuild it. United Decorators can help you create an entirely new design to complement your current home decor. Styles and design tastes change throughout the years, so it makes sense to reupholster your furniture with gorgeous fabrics too. Slipcovers aren’t just for covering event venue chairs. Custom slipcovers are used in thousands of homes to protect furnishings and add a decorative design element. Slipcovers are easy to remove and wash. For homes with pets and children, spills and messes can easily be cleaned up. Slipcovers are a cost-effective way to renew the look of your interior decor on your chairs, sofa, couches, sectionals, and recliners. A slipcover will help protect your furniture from damage, dust, and stains. Maybe your dog or cats use your chairs or your sofa as their personal beds. It is easy to pop a slipcover in the wash to remove animal hairs and smells, leaving your home looking and smelling fresh. Some customers like to deck the halls and walls with seasonal decorations. Change slipcovers seasonally to update your home for each holiday quickly. Use splashes of blue and white for Hanukkah and festive reds at Christmas. Slipcovers are desirable when you have large gatherings in your home. It’s also easy to create a festive vibe with a decorative slipcover. If you are searching for a fabric store near you, contact Paul & Dalia Sajovits, Owners at United Decorators, for your next interior design project. United Decorators is a window treatment and fabric store with the most knowledge, experience and a large selection of fabric styles and colors for all your home décor needs. Contact United Decorators at 718-253-9300 to schedule a free design consultation or to obtain a free estimate on your upholstery project in Brooklyn, New York City, New Jersey or Staten Island.